Virginica oysters are raised in two different Washington locations, southern Puget Sound’s Totten Inlet and and northern Puget Sound’s Samish Bay. They are unique in that they are the first eastern oysters to be grown commercially in Washington state since the early 1900’s, when a large quantity were grown in Willapa Bay for the oyster hungry San Francisco market. 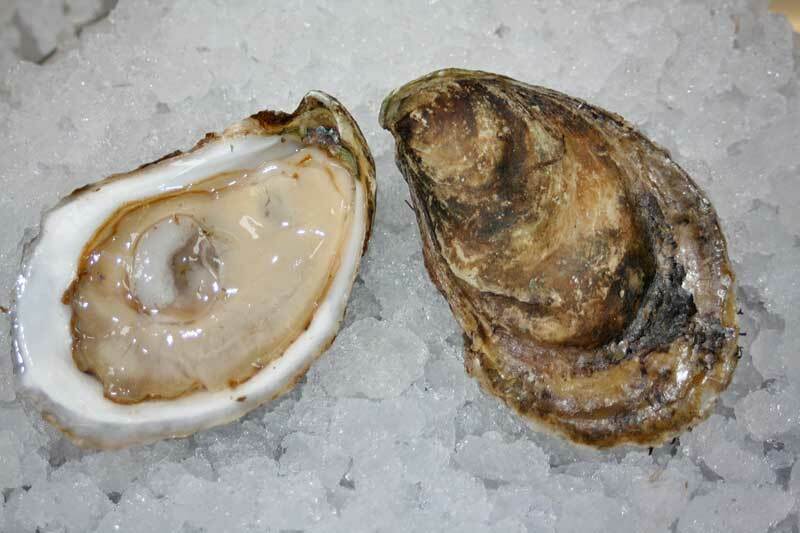 They were successfully grown and marketed from that location for many years until early in the 1930’s when the Willapa growers began to lose interest in the slow growing eastern oysters after the fast growing pacific oyster was introduced. They begin their lives in a state of the art oyster hatchery in the town of Quilcene and are then allowed to mature on the beaches of Totten Inlet and Samish Bay. Virginicas take three to five years to reach three and one half inches, which is the size at which the cup has fully developed. They have an attractive and clean pear shape, and the shells are quite smooth, lacking the sharp flutes common to pacific oysters. Their flavor begins fairly saltly, then goes very sweet for an eastern species, and ends with a mild mineral like finish. Virginica Oyster - Marinelli Shellfish Co.